Today’s tribute is from Erik Stengler, who created the website Erik’s Michael Crichton Collection in May 2008. I am shocked and stunned too, and was also utterly unprepared for this news. Now that our enthusiasm for his work and life was gaining momentum, it is all cut short by this terrible loss. I must say I couldn't keep back tears, and I will try to turn my webpage into a deserved memorial site devoted to this great author, but most of all, great person. 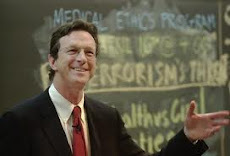 There is so much to read about the news of Michael Crichton's death, so much to say and so much left unsaid. I am at loss to decide what to say, where to begin, I just can't start. And it's because it is still difficult for me to believe that it has happened. I first read a book of his in 1994; it was A Case of Need. Since then I just became more and more fond of all his works and started to look out for anything that he has produced, and enjoyed it all. For me he has been the voice of who speaks out for the human dimension in the world of science and technology, a voice that is much needed, because it is unfortunately not so common. His concern for the human being and love for life will never be forgotten. To all those close to him, I want to send my most profound condolences and my prayers but also a word of encouragement in these difficult moments: never forget that you have been blessed with the gift of having been near him, of having shared unique moments of his life, of having known and loved such a great person. Many of us have been wishing for just a few moments of the honour of being near Michael Crichton. You have the treasure of having been dear to him. Do regard this as a privilege that life has granted you and count on all of us, his fans, readers and viewers for never allowing his memory to fade off the least. Michael Crichton's death left many of us with a great void, one that never will be filled again. We were unprepared for his departure, because all his works were so full of life. He not only brought dinosaurs back to life, but was profoundly concerned with our life, human life. Many reviews have pointed out the great variety of topics and stories of his works. However, there is a common thread to all of them, if one looks closely: a deep and well-founded worry about the shrinking space left for humaneness in a society that becomes more and more dependent on technology. Michael Crichton was eager to call our attention towards the need of bringing the human being back to the center of our civilization. Be it in the form of robots on the rampage, medical abuses or an exaggerated paranoia about global warming, his warnings against forgetting that people should never be second to any other priority, let alone left out of the picture altogether, will never lose relevance. On the contrary, his reminder will unfortunately be ever more necessary as we go along the path of filling our lives with technology. Let this website be one of the many signposts that keep alive his directions for building a more humane world. Erik Stengler is the Head of Education and Public Outreach at Museo de la Ciencia y el Cosmos (Museum of Science and the Cosmos) on the island Tenerife, Canary Islands, Spain. He is also a freelance screenwriter for planetarium shows.